Lack of water is predicted to cause significant problems in coming years. On Earthgauge Radio yesterday, we discussed some of the looming problems of global water scarcity in an age of rising demand and climate change. Appropriately, this story only confirms that we are in for a rocky road in the coming decades if action is not taken to address some of our serious water challenges. 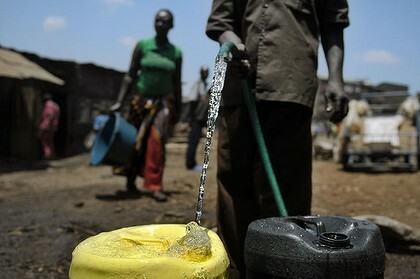 A new report by the U.S. office of the Director of National Intelligence said that areas including South Asia, the Middle East and North Africa will face major challenges in coping with water problems that could hinder the ability to produce food and generate energy. The language employed in the report does not equivocate. This is not the report of an environmental organization. This is an Intelligence Community Assessment (ICA) prepared by the U.S. Director of National Intelligence on a request made by Secretary of State Hillary Rodham Clinton to assess the impact of global water issues on U.S. national security interests over the next 30 years. Their findings? Fresh water supplies are unlikely to keep up with global demand by 2040, increasing political instability, hobbling economic growth and endangering world food markets. Here are a couple excerpts from the report. Read the news release here. During the next 10 years, many regions will experience water challenges – shortages, poor water quality, or floods – that will increase the risk of instability and state failure, increase regional tensions, and distract them from working with the United States on important U.S. policy objectives. Between now and 2040, fresh water availability will not keep up with demand absent more effective management of water resources. Water problems will hinder the ability of key countries to produce food and generate energy, posing a risk to global food markets and hobbling economic growth. As a result of demographic and economic development pressures, North Africa, the Middle East, and South Asia will face major challenges coping with water problems. While wars over water are unlikely within the next 10 years, water challenges – shortages, poor water quality, floods – will likely increase the risk of instability and state failure, exacerbate regional tensions, and distract countries from working with the United States on important policy objectives, according to an assessment prepared by the U.S. Intelligence Community (IC). For more info, check out this article in the U.S. Insurance Journal.